As people believed, flower is the symbol of love and romantic. The bride can easily create an amazing image with blooming bouquet. The bouquet is not just a lovely accessory but also a work of art which is as unique as your personality and sense of beauty. When it comes to the meaning of bouquet arrangement, you should know that it typically stands for joy and happiness. At the same time, the bouquet is luxurious, impressive and carries a representative message. How to choose bridal bouquet? Details from other wedding accessories may give you inspiration. Perhaps a decorative detail from your wedding dress will give inspiration to the bouquet. Pink rose with its intoxicating fragrance, could combine with a cocktail wedding dress, while the elegant lily might look like the abundant ruffles of a skirt. The design of your bouquet is completely dependent on the style, shape and detail of your wedding dress. 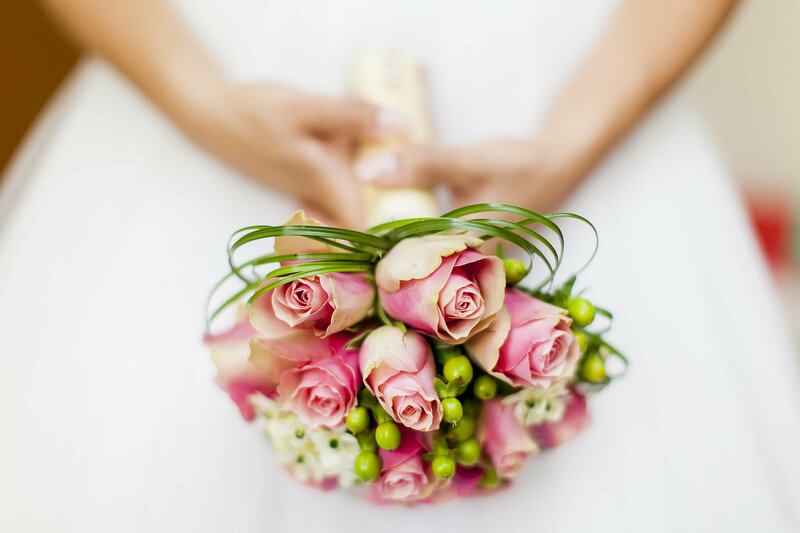 As a bride, the first thing you need to know is the meanings of various flowers. Rose is a symbol of love. It is the best spokesperson of love, many brides would like to choose roses as her bouquet. However, roses in different colors have different meanings. Red roses on behalf of love, pink roses are the declaration of love, white roses represent innocence, purity and respect. You need to remember that some flowers are not available at certain times of the year, so make sure you take this into consideration when choosing which flowers to incorporate into your bouquet. Finally, make sure your bouquet look perfect until the end of the day. Another popular choice is carnation. Blooming carnations on behalf of warm. They are representative of love, charm and respect. Light red carnations on behalf of admiration,while pure white carnations represent the purity of love and luck. Pink carnations have the most important and historical significance, so the pink carnation became a symbol of immortal love. In order to create a romance atmosphere, you can use a large number of foam roses in your wedding arrangement. Apart from charming bouquet, a high quality bouquet holder is also needed. The lily is also a fascinating choice. In Christianity, lilies symbolize purity, chastity and innocence. In China, the lily is a symbol of maternal love. Lilies are well used in the wedding, meaning that young couples will be happy forever. In ancient Rome and Greece, the lily symbolizes purity and innocence, you can also use the combination of lily and wheat as the bride’s headdress. The lilies are rich in colors. Yellow lily expresses gratitude and happiness. Camo wedding favors can add interesting atmosphere for you wedding. Enjoy your beautiful bouquet and just relax your state of mind. Remember you and your lover deserve a happy wedding.